Operators are very familiar with basic mathematics. Operator is nothing but performing the specific operation between operands. It is called the operator. Operators can be classified based on the operations that they perform or based on the number of operands it operates on. Based on the number of operands, we can classify operators as given below. The unary operators operate on a single operand. The addition, subtraction and multiplication operators are used as unary operator in python. We will discuss more about this operator below. A binary operator is an operator that operates on two operands. The ternary operator is an operator that operates on three operands. The first argument is an expression, If expression is true then second argument will execute else third argument will execute. Now, we are going in detail of all operators one by one. Assignment operator is used to assign value to a variable (memory location). It evaluates expression on right side of = symbol and assigns evaluated value to left side the variable. The RHS of assignment operator must be a constant, expression or variable. Whereas LHS must be a variable (valid memory location). There are many ways of using the short hand operator. They are listed below. Relational operator is nothing but an operator which defines some kind of relationship between two entities or two objects or two variables. The concept of logical operators is simple. Logical operator is divided as below. In The ‘in’ operator is used to check if a value exists in a sequence or not. 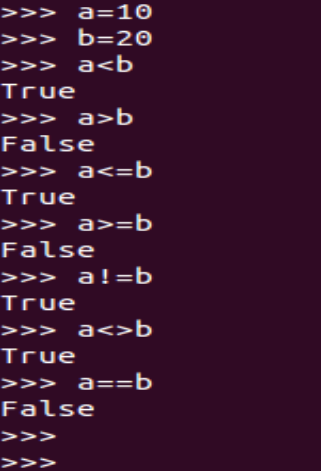 Evaluates to true if it finds a variable in the specified sequence and false otherwise. 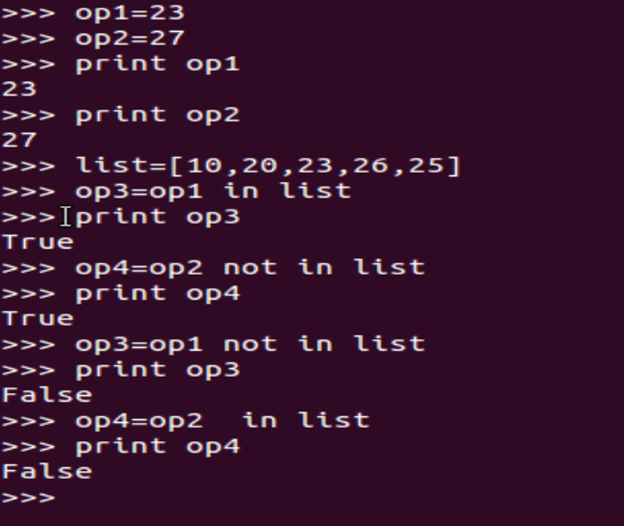 not in This operand is used to find the variable which are not existing other than the values given in the sequence. x=42 y=42 if ( x is y): print "both are same identity" else: print "both are different identity" y=35 if ( x is not y): print "both are different identity" else: print "both are same identity"
print "both are same identity"
print "both are different identity"
Bitwise operator is working on 0 and 1’s and manipulate the bits, it will give the performance wise very well. Bitwise operation scripting is very helpful in hardware level programming.